The Ontario Trillium Foundation is an agency of the Ministry of Culture, which receives annually $100 million in government funding generated through Ontario’s charity casino initiative. 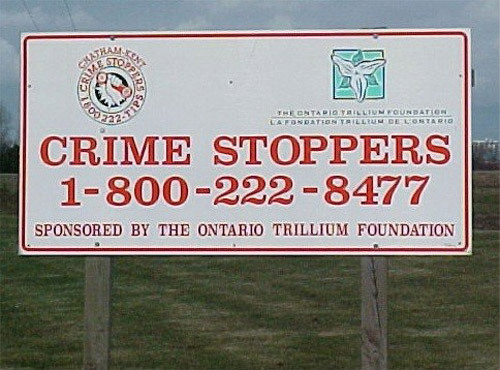 Chatham-Kent Crime Stoppers has received $25,000.00 in funding from the Ontario Trillium Foundation in each of the last two years, for a total of $50,000.00. This has enabled us to complete the following projects. 1. Road sign campaign – we were able to erect twenty 4X8 foot signs outside of all urban areas in Chatham-Kent. These signs are made of galvalum and are reflective. This has greatly increased the awareness of our program. 2. 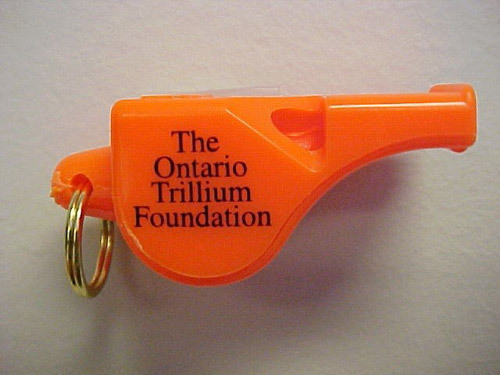 Whistle campaign – we purchased over 11,000 Fox Forty whistles. 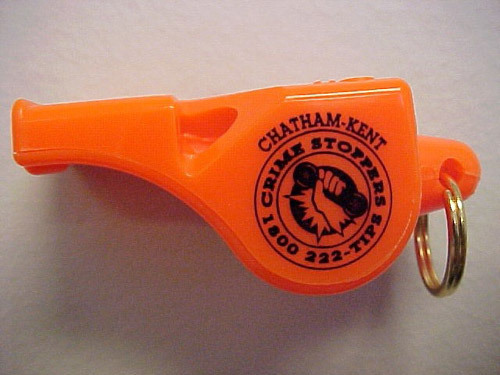 The marine units of the Chatham-Kent Police and the Ontario Provincial Police handed these out. They were also given out to our fire departments, search and rescue team and women’s groups as well as many community groups. Our school safety patrollers are all issued one of our whistles. 3. Police Cutouts – We have placed life size cutouts of a police officer in every school in Chatham-Kent. There have also been over fifty cutouts placed in larger businesses in our community. The school cutouts carry messages appropriate to schools such as “Bullies aren’t cool” as well as three other messages. The business signs carry anti shoplifting and anti fraud messages. These cutouts are made of sintra, a very durable product. Pictured below are our projects. For more information feel free to contact us.